HEMPSTEAD, NY—In an apparent attempt to demonstrate empathy for everyday working Americans, GOP candidate Mitt Romney likened the audience at the town hall debate Tuesday to the many horses he owns and cares for, saying that, in a way, the majority of the American people are like helpless stable animals. “The horses I own, especially the ones who specialize in dressage, need constant attention because they are unable to care for themselves, much like all of you,” said Romney, adding that to the extent that horses aren’t the smartest animals out there, average Americans “aren’t that bright either.” “See, if I didn’t buy my horses and train them, they would be roaming around a some field somewhere, lacking any sort of direction. They wouldn’t know there is a better, more fulfilling life for them out there in which I am their owner and master. 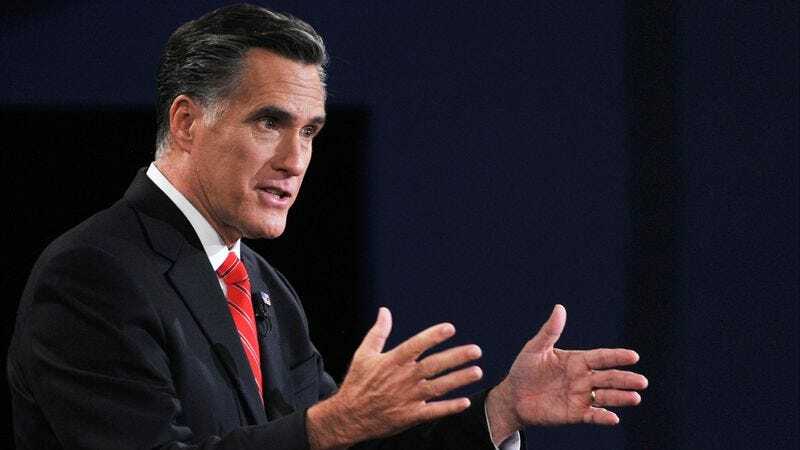 So what I’m saying is, let me buy you, and everything will be better.” To further the analogy, Romney said that when Americans get sick or break a leg, they should be shot.